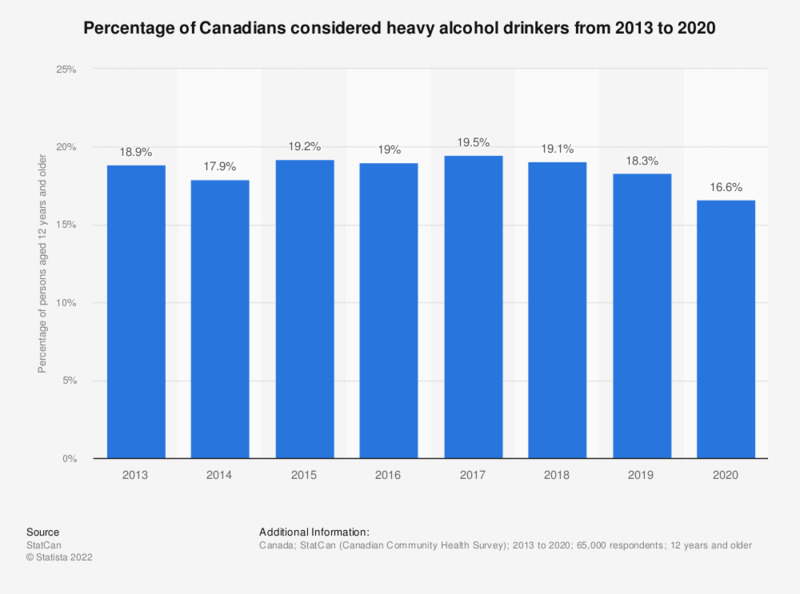 This statistic displays the estimated percentage of Canadians aged 12 years and over who are considered heavy alcohol drinkers from 2013 to 2017. In 2017, around 19.5 percent of Canadians reported heavy drinking at least once in the past month. All figures are annual estimates. Since 2007, data for the Canadian Community Health Survey (CCHS) are collected yearly instead of every two years. While a sample of approximately 130,000 respondents were interviewed during the reference periods of 2003 and 2005, it has been changed to 65,000 respondents each year starting in 2007. A definition change was implemented in 2013 to conform with the World Health Organization (WHO) and Health Canada guidelines for Heavy drinking. Heavy drinking refers to males who reported having 5 or more drinks, or women who reported having 4 or more drinks, on one occasion, at least once a month in the past year. While this indicator remains comparable for males to the 5 or more drinks indicator published in previous years, it is no longer comparable for females. Figures from 2013 and 2014 were taken from an archived page from the same source and can be accessed here. As a result of the 2015 redesign, Canadian Community Health Survey (CCHS) has a new collection strategy, a new sample design, and has undergone major content revisions. With all these factors taken together, caution should be taken when comparing data from previous cycles to data released for the 2015 cycle onwards. Thinking specifically about drinking alcohol at university, how much do you agree or disagree with the following statements?